For The Anthroposophical Society, see Anthroposophical Society. Anthroposophy is a philosophy founded by Rudolf Steiner that postulates the existence of an objective, intellectually comprehensible spiritual world that is accessible by direct experience through inner development. More specifically, it aims to develop faculties of perceptive imagination, inspiration and intuition through the cultivation of a form of thinking independent of sensory experience, and to present the results thus derived in a manner subject to rational verification. Anthroposophy aims to attain in its study of spiritual experience the precision and clarity attained by the natural sciences in their investigations of the physical world. The philosophy has double roots in German idealism and German mysticism and was initially expressed in language drawn from Theosophy. Anthroposophical ideas have been applied practically in many areas including Steiner/Waldorf education, special education (most prominently through the Camphill Movement), biodynamic agriculture, medicine, ethical banking, organizational development, and the arts. The Anthroposophical Society has its international center at the Goetheanum in Dornach, Switzerland. Modern critics, particularly Michael Shermer, have termed anthroposophy's application in areas such as medicine, biology, and biodynamic agriculture to be pseudoscience. Anthroposophy has also been termed "the most important esoteric society in European history." By the beginning of the twentieth century, Steiner's interests turned to explicitly spiritual areas of research. His work began to interest others interested in spiritual ideas; among these was the Theosophical Society. From 1900 on, thanks to the positive reception given to his ideas, Steiner focused increasingly on his work with the Theosophical Society becoming the secretary of its section in Germany in 1902. During the years of his leadership, membership increased dramatically, from a few individuals to sixty-nine Lodges. By 1907, a split between Steiner and the mainstream Theosophical Society had begun to become apparent. While the Society was oriented toward an Eastern and especially Indian approach, Steiner was trying to develop a path that embraced Christianity and natural science. The split became irrevocable when Annie Besant, then president of the Theosophical Society, began to present the child Jiddu Krishnamurti as the reincarnated Christ. Steiner strongly objected and considered any comparison between Krishnamurti and Christ to be nonsense; many years later, Krishnamurti also repudiated the assertion. Steiner's continuing differences with Besant led him to separate from the Theosophical Society Adyar; he was followed by the great majority of the membership of the Theosophical Society's German Section, as well as members of other national sections. By this time, Steiner had reached considerable stature as a spiritual teacher. He spoke about what he considered to be his direct experience of the Akashic Records (sometimes called the "Akasha Chronicle"), thought to be a spiritual chronicle of the history, pre-history, and future of the world and mankind. In a number of works, Steiner described a path of inner development he felt would let anyone attain comparable spiritual experiences. Sound vision could be developed, in part, by practicing rigorous forms of ethical and cognitive self-discipline, concentration, and meditation; in particular, a person's moral development must precede the development of spiritual faculties. In 1912, the Anthroposophical Society was founded. After World War I, the Anthroposophical movement took on new directions. Projects such as schools, centers for those with special needs, organic farms and medical clinics were established, all inspired by anthroposophy. In 1923, faced with differences between older members focusing on inner development and younger members eager to become active in the social transformations of the time, Steiner refounded the Society in an inclusive manner and established a School for Spiritual Science. As a spiritual basis for the refounded movement, Steiner wrote a "Foundation Stone Meditation" which remains a central meditative expression of anthroposophical ideas. By 2007, national branches of the Anthroposophical Society had been established in fifty countries, and about 10,000 institutions around the world were working on the basis of anthroposophy. In the same year, the Anthroposophical Society was called the "most important esoteric society in European history." Anthroposophy is an amalgam of the Greek terms ἄνθρωπος (anthropos = "human") and σοφία (sophia = "wisdom"). An early English usage is recorded by Nathan Bailey (1742) as meaning "the knowledge of the nature of man." Authors whose usage of the term predates Steiner's include occultist Agrippa von Nettesheim, alchemist Thomas Vaughan (Anthroposophia Theomagica), and philosopher Robert Zimmermann. Steiner began using the term in the early 1900s as an alternative to the term theosophy (divine wisdom), a term central to the Theosophical Society, with which Steiner was associated at the time, and to a long tradition of European esotericists. Steiner probably first encountered the word "anthroposophy" in the work of Zimmermann, some of whose lectures in the University of Vienna he had attended while a student. Anthroposophical proponents aim to extend the clarity of the scientific method to phenomena of human soul-life and to spiritual experiences. This requires developing new faculties of objective spiritual perception, which Steiner maintained was possible for humanity today. The steps of this process of inner development he identified as consciously achieved imagination, inspiration and intuition. Steiner believed results of this form of spiritual research should be expressed in a way that can be understood and evaluated on the same basis as the results of natural science: "The anthroposophical schooling of thinking leads to the development of a non-sensory, or so-called supersensory consciousness, whereby the spiritual researcher brings the experiences of this realm into ideas, concepts, and expressive language in a form which people can understand who do not yet have the capacity to achieve the supersensory experiences necessary for individual research." Steiner hoped to form a spiritual movement that would free the individual from any external authority: "The most important problem of all human thinking is this: to comprehend the human being as a personality grounded in him or herself." For Steiner, the human capacity for rational thought would allow individuals to comprehend spiritual research on their own and bypass the danger of dependency on an authority. Steiner contrasted the anthroposophical approach with both conventional mysticism, which he considered lacking the clarity necessary for exact knowledge, and natural science, which he considered arbitrarily limited to investigating the outer world. Anthroposophy took over from Theosophy a complex system of cycles of world development and human evolution. The evolution of the world is said to have occurred in cycles. The first phase of the world consisted only of heat. In the second phase, a more active condition, light, and a more condensed, gaseous state separate out from the heat. In the third phase, a fluid state arose, as well as a sounding, forming energy. In the fourth (current) phase, solid physical matter first exists. This process is said to have been accompanied by an evolution of consciousness which led up to present human culture. This is a pedagogical movement with over 1000 Steiner or Waldorf schools (the latter name stems from the first such school, founded in Stuttgart in 1919) located in some 60 countries; the great majority of these are independent (private) schools. Sixteen of the schools have been affiliated with the United Nations' UNESCO Associated Schools Project Network, which sponsors education projects that foster improved quality of education throughout the world. Waldorf schools receive full or partial governmental funding in some European nations, Australia and in parts of the United States (as Waldorf method public or charter schools). Steiner gave several series of lectures to physicians and medical students. Out of those grew a complementary medical movement intending to "extend the knowledge gained through the methods of the natural sciences of the present age with insights from spiritual science." This movement now includes hundreds of M.D.s, chiefly in Europe and North America, and has its own clinics, hospitals, and medical schools. One of the most studied applications has been the use of mistletoe extracts in cancer therapy. The extracts are generally no longer used to reduce or inhibit tumor growth, for which verifiable results have been found in vitro and in animal studies but not in humans, but instead to improve the patients' quality of life and to reduce tumor-induced symptoms and the side-effects of chemotherapy and radiotherapy. According to the National Cancer Institute, "Mistletoe extract has been shown to kill cancer cells in the laboratory and to affect the immune system. However, there is limited evidence that mistletoe's effects on the immune system help the body fight cancer.... At present, the use of mistletoe cannot be recommended outside the context of well-designed clinical trials." Several pharmaceutical companies have grown out of anthroposophical medicine, including Weleda, Wala, and Dr. Hauschka. Architects who have been strongly influenced by the anthroposophic style include Imre Makovecz in Hungary, Hans Scharoun and Joachim Eble in Germany, Erik Asmussen in Sweden, Kenji Imai in Japan, Thomas Rau, Anton Alberts and Max van Huut in the Netherlands, Christopher Day and Camphill Architects in the UK, Thompson and Rose in America, Denis Bowman in Canada, and Walter Burley Griffin and Gregory Burgess in Australia. ING House in Amsterdam is a contemporary building by an anthroposophical architect which has received awards for its ecological design and approach to a self-sustaining ecology as an autonomous building and example of sustainable architecture. Around the world today are a number of banks, companies, charities, and schools for developing co-operative forms of business using Steiner's ideas about economic associations, aiming at harmonious and socially responsible roles in the world economy. The first anthroposophic bank was the Gemeinschaftsbank für Leihen und Schenken in Bochum, Germany, founded in 1974. Socially responsible banks founded out of anthroposophy in the English-speaking world include Triodos Bank, founded in 1980 and active in the UK, Netherlands, Germany, Belgium, and Spain. Cultura Sparebank dates from 1982 when a group of Norwegian anthroposophists start to grow the idea of having ethical banking but only in the late 90s the bank starts to operate as a savings bank in Norway. La Nef in France and RSF Social Finance in San Francisco are other examples. 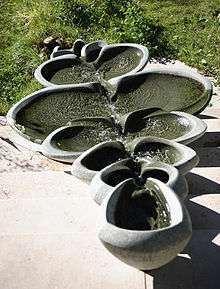 John Wilkes' fountain-like flowforms, sculptural forms that guide water into rhythmic movement and are used both in water-purification projects and decoratively. According to Steiner, a real spiritual world exists,evolving along with the material one. Steiner held that the spiritual world can be researched in the right circumstances through direct experience, by persons practicing rigorous forms of ethical and cognitive self-discipline. Steiner described many exercises he said were suited to strengthening such self-discipline; the most complete exposition of these is found in his book How To Know Higher Worlds. The aim of these exercises is to develop higher levels of consciousness through meditation and observation. Details about the spiritual world, Steiner suggested, could on such a basis be discovered and reported, though no more infallibly than the results of natural science. 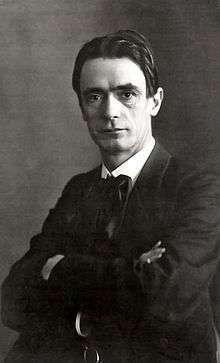 Rudolf Steiner wrote and lectured on Judaism and Jewish issues for much of his life. In the 1880s and 1890s, he took part in debates on anti-semitism and on assimilation. He was a fierce opponent of anti-semitism and supported the unconditional acceptance and integration of the Jews in Europe. He also supported Émile Zola's position in the Dreyfus affair. In his later life, Steiner was accused by the Nazis of being a Jew, and Adolf Hitler called anthroposophy "Jewish methods". The anthroposophical institutions in Germany were banned during Nazi rule and several anthroposophists sent to concentration camps. Steiner emphasized Judaism's central importance to the constitution of the modern era in the West but suggested that to appreciate the spirituality of the future it would need to overcome its tendency toward abstraction. Important early anthroposophists who were Jewish included two central members on the executive boards of the precursors to the modern Anthroposophical Society, and Karl König, the founder of the Camphill movement. Martin Buber and Hugo Bergmann, who viewed Steiner's social ideas as a solution to the Arab–Jewish conflict, were also influenced by anthroposophy. There are several anthroposophical organisations in Israel, including the anthroposophical kibbutz Harduf, founded by Jesaiah Ben-Aharon. A number of these organizations are striving to foster positive relationships between the Arab and Jewish populations: The Harduf Waldorf school includes both Jewish and Arab faculty and students, and has extensive contact with the surrounding Arab communities. In Hilf near Haifa, there is a joint Arab-Jewish Waldorf kindergarten, the first joint Arab-Jewish kindergarten in Israel. Towards the end of Steiner's life, a group of theology students (primarily Lutheran, with some Roman Catholic members) approached Steiner for help in reviving Christianity, in particular "to bridge the widening gulf between modern science and the world of spirit." They approached a notable Lutheran pastor, Friedrich Rittelmeyer, who was already working with Steiner's ideas, to join their efforts. Out of their co-operative endeavor, the Movement for Religious Renewal, now generally known as The Christian Community, was born. Steiner emphasized that he considered this movement, and his role in creating it, to be independent of his anthroposophical work, as he wished anthroposophy to be independent of any particular religion or religious denomination. Anthroposophy's supporters include Pulitzer Prize-winning and Nobel Laureate Saul Bellow, Nobel prize winner Selma Lagerlöf, Andrei Bely, Joseph Beuys, Owen Barfield, architect Walter Burley Griffin, Wassily Kandinsky, Andrei Tarkovsky, Bruno Walter, and Right Livelihood Award winners Sir George Trevelyan and Ibrahim Abouleish. Albert Schweitzer was a friend of Steiner's and was supportive of his ideals for cultural renewal. His primary interest was in applying the methodology of science to realms of inner experience and the spiritual worlds (Steiner's appreciation that the essence of science is its method of inquiry is unusual among esotericists), and Steiner called anthroposophy Geisteswissenschaft (lit. : Science of the mind, or cultural or spiritual science), a term generally used in German to refer to the humanities and social sciences; in fact, the term "science" is used more broadly in Europe as a general term that refers to any exact knowledge. [Anthroposophy's] methodology is to employ a scientific way of thinking, but to apply this methodology, which normally excludes our inner experience from consideration, instead to the human being proper. Whether this is a sufficient basis for anthroposophy to be considered a spiritual science has been a matter of controversy. As Freda Easton explained in her study of Waldorf schools, "Whether one accepts anthroposophy as a science depends upon whether one accepts Steiner's interpretation of a science that extends the consciousness and capacity of human beings to experience their inner spiritual world." Sven Ove Hansson has disputed anthroposophy's claim to a scientific basis, stating that its ideas are not empirically derived and neither reproducible nor testable. Carlo Willmann points out that as, on its own terms, anthroposophical methodology offers no possibility of being falsified except through its own procedures of spiritual investigation, no intersubjective validation is possible by conventional scientific methods; it thus cannot stand up to positivistic science's criticism. Peter Schneider calls such objections untenable on the grounds that if a non-sensory, non-physical realm exists, then according to Steiner the experiences of pure thinking possible within the normal realm of consciousness would already be experiences of that, and it would be impossible to exclude the possibility of empirically grounded experiences of other supersensory content. Olav Hammer suggests that anthroposophy carries scientism "to lengths unparalleled in any other Esoteric position" due to its dependence upon claims of clairvoyant experience, its subsuming natural science under "spiritual science", and its development of what Hammer calls "fringe" sciences such as anthroposophical medicine and biodynamic agriculture justified partly on the basis of the ethical and ecological values they promote, rather than purely on a scientific basis. Though Steiner saw that spiritual vision itself is difficult for others to achieve, he recommended open-mindedly exploring and rationally testing the results of such research; he also urged others to follow a spiritual training that would allow them directly to apply the methods he used eventually to achieve comparable results. Some results of Steiner's research have been investigated and supported by scientists working to further and extend scientific observation in directions suggested by an anthroposophical approach. As an explicitly spiritual movement, anthroposophy has sometimes been called a religious philosophy. In 2005, a California federal court ruled that a group alleging that anthroposophy is a religion for Establishment Clause purposes did not provide any legally admissible evidence in support of this view; the case is under appeal. In 2000, a French court ruled that a government minister's description of anthroposophy as a cult was defamatory. "A naive version of the evolution of consciousness, a theory foundational to both Steiner's anthroposophy and Waldorf education, sometimes places one race below another in one or another dimension of development". ↑ Ullrich, Heiner (2010). Rudolf Steiner: Leben und Lehre. Munich: C. H. Beck. p. 9. ↑ The Skeptic Encyclopedia of Pseudoscience. ABC-CLIO. 2002. pp. 31–. ISBN 9781576076538. ↑ Ruse, Michael (2013-09-25). The Gaia Hypothesis: Science on a Pagan Planet. University of Chicago Press. pp. 128–. ISBN 9780226060392. Retrieved 21 June 2015. ↑ "Goetheanum". 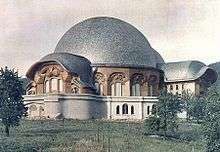 Goetheanum. Retrieved 2013-12-31. ↑ Verhulst, Jos (2003). Developmental Dynamics. Ghent, NY: Adonis Press. pp. 24–25. ISBN 978-0-932776-28-0. ↑ German Education Research Group, "International Associations and Waldorf Schools in alphabetical order of country" Archived September 16, 2008, at the Wayback Machine. ↑ David Kupfer, "Trailblazers, Heroes & Pioneers: The Organic Farming Movement"
↑ "Study by the National Cancer Institute on mistletoe's use for treating cancer". Cancer.gov. Archived from the original on 2010-12-21. Retrieved 2013-12-31. ↑ "National Cancer Institute website". Cancer.gov. Retrieved 2013-12-31. ↑ "Mistletoe Extracts (PDQ®) - National Cancer Institute". Cancer.gov. 2002-12-21. Retrieved 2013-12-31. ↑ Raab and Klingborg, Waldorfschule baut, Verlag Freies Geistesleben, 2002. ↑ Sokolina, Anna, ed., co-author, Architecture and Anthroposophy. (Arkhitektura i Antroposofiia. bilingual ed.) 1st and 2nd edition. 268p. M.: KMK Scientific Press. 2001, ISBN 5-87317-074-6. 2010, ISBN 5-87317-660-4. ↑ Heathcote, Edwin (2011-09-28). "Imre Makovecz (1935 – 2011)". Bdonline.co.uk. Retrieved 2013-12-31. ↑ Raab, Klingborg and Fånt, Eloquent Concrete, London: 1979. ↑ "Gemeinschaftsbank für Leihen und Schenken". Gls.de. Retrieved 2013-12-31. ↑ "Earth Times". Earth Times. Retrieved 2013-12-31. ↑ Byckling, L: Michael Chekhov as Actor, Teacher and Director in the West. Toronto Slavic Quarterly No 1 — Summer 2002. University of Toronto, Academic Electronic Journal in Slavic Studies. ↑ "The Inner Development of Man". Fremont, Michigan: Rsarchive.org. 1904-12-15. Retrieved 2013-12-31. 1 2 Stein, W. J., Die moderne naturwissenschaftliche Vorstellungsart und die Weltanschauung Goethes, wie sie Rudolf Steiner vertritt, reprinted in Meyer, Thomas, W.J. Stein / Rudolf Steiner, pp. 267–75; 256–7. ↑ Doris T. Myers, "C.S. Lewis in Context." Kent State University Press, 1994. ↑ Rudolf Steiner,"Anthroposophy and Christianity"
↑ Steiner, Rudolf (1996). The foundations of human experience. Anthroposophic Press. p. 34. ISBN 0-88010-392-2. ↑ Steiner, Rudolf (December 16, 1908). "A Chapter of Occult History". ↑ Rudolf Steiner, "The Appearance of Christ in the Etheric World"
↑ Liukkonen, Petri. "Andrey Bely". Books and Writers (kirjasto.sci.fi). Finland: Kuusankoski Public Library. ↑ Elsworth, J. D. (1983). "Andrej Bely: A Critical Study of the Novels". Cambridge. ↑ David Hier. "Arts Ablaze, ''Kandinsky: The Path to Abstraction 1908–1922''". Gbh-Chs: Artsablaze.co.uk. Retrieved 2013-12-31. ↑ "Layla Alexander Garrett, Nostalghia, ''Andrey Tarkovsky-Enigma and Mystery''". Acs.ucalgary.ca. Retrieved 2013-12-31. ↑ "Philolex entry". Philolex.de. Retrieved 2013-12-31. ↑ Sven Ove Hansson, Is Anthroposophy Science?, Professor, Philosophy Unit of the Swedish Royal Institute of Technology, in Conceptus XXV (1991), No. 64, pp. 37–49. ↑ Genetics and the Manipulation of Life, The Forgotten Factor of Context, by biologist Craig Holdrege; The Wholeness of Nature, Goethe's Way toward A Science of Conscious Participation in Nature, by physicist Henri Bortoft; Developmental Dynamics in Humans and Other Primates, by theoretical chemist Jos Verhulst. ↑ Storr, Anthony (1997) . "IV. Rudolf Steiner". Feet of Clay: Saints, Sinners, and Madmen: A Study of Gurus. New York: Free Press Paperbacks, Simon & Schuster. pp. 69–70. ISBN 0-684-83495-2. ↑ anthroposophy definition - Dictionary - MSN Encarta. Archived from the original on 2009-11-01. ↑ "Guyard Guilty of Defamation". Cesnur. 2000-03-23. Archived from the original on 11 December 2006. Retrieved 2006-11-13. ↑ Jakob Wilhelm Hauer, 7. Februar 1935. BAD R 4901–3285. ↑ Report of the SD-Hauptamtes Berlin: "Anthroposophy”, May 1936, BAD Z/B I 904. ↑ The General Council of the Anthroposophical Society in America (1998) Position Statement on Diversity. Look up spiritual in Wiktionary, the free dictionary. Wikimedia Commons has media related to Anthroposophy. Look up anthroposophy in Wiktionary, the free dictionary.